RunTri: Half Ironman: How Many Triathletes Enter but do not Start or Finish the race? Half Ironman: How Many Triathletes Enter but do not Start or Finish the race? More than 67,000 triathletes registered for 40 half ironman distance races last year. But how many paid to the entry fees only to skip the race altogether, or to start but not finish? About 20%, on average. 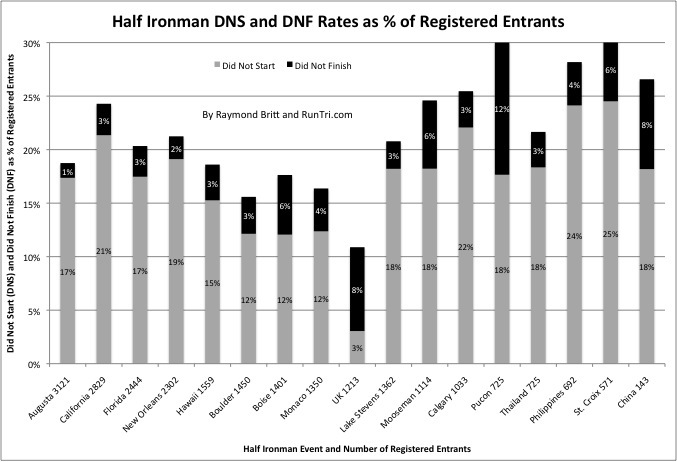 In most all of the races we examined, more than 15% of those who registered did not make it to the starting line. In many events, of those who raced, at least 3% to 4% did not finish, though the rate soared to the 10% range for a few very tough events.